Savvy Mumma: Reading - Do it more! Reading - Do it more! I used to go through a book a day. I visited my library all the time. I love reading and almost all my reading is non fiction. Having children saw my reading go out the window a little. Recently I started to read again and I can't get enough of it. I actually plan on going back to Uni to study, so this is good preparation! Last weekend I visited my local library and ducked my head in to an op shop. Obviously I got a little excited because this is the pile of books I ended up with! Remarkably, I have finished 5 of them already! My aim this year on my other blog was to read 24 books, or 2 books a month. I have a list of specific books I want to read and some will definitely take me longer than others, but I am loving the motivation I have now to read, write and learn. It has been so refreshing and stimulating to be learning new things every night. I don't watch TV anymore, rarely watch movies and my kids are not always with me, so I have a lot of time. 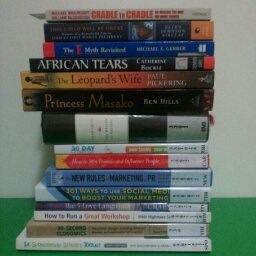 Most of the books I am reading are biographies or books on psychology, economics, finance and marketing. These are my main interests right now.